We send all of our goods via Australia Post, either express post or registered mail. To calculate freight, put the items into your shopping cart and select the Estimate Shipping button, the freight is then calculated before checkout, this does NOT create an obligation to buy..
Freight estimate does not included the time for items to be made to order, only for the time taken from our premises and is an Australia Post estimate..
We accept most major credit cards via paypal, you may also pay by direct bank deposit as well. I will confirm a size later Pony 32.5cm / 12 3/4" Large Pony 33.5cm / 13 1/4" Cob 34.5cm / 13 1/2" Large Cob 36cm / 14 1/4" Full 38cm / 15" Large Hack 40cm 15 3/4" Warmblood 42cm / 16 1/2"
With the hunter upgrade, your show browband will be made with heavy duty press studs for quick and easy removal from the bridle. You will also get a plain leather browband in black or brown with the same press studs. If you only want the press studs on your show browband, and not the accompanying leather browband, then purchase the Press Studs Only option. Please note: these are made to order, so please allow 2 weeks plus postage time for your order to come to you. 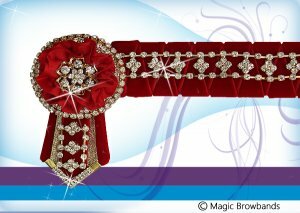 If you are in a hurry please either select the rush fee option or check our in stock range of browbands that are ready to go. This product was added to our catalog on Monday 02 November, 2015. Store created by Webzings with a Template designed by by Picaflor Azul. Copyright © 2019 Magic Browbands. Powered by Zen Cart.